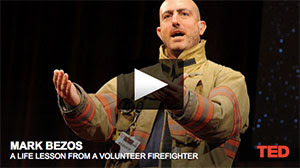 This four minute clip is a great TEDtalk from a volunteer firefighter who encourages us to do the little things. This from a man who works for a non-profit and regularly trains for a part-time volunteer gig as a hero. He knows about the big things – yet he advocates for doing the little things. I am the kind of person who likes to do big things. This is why I love teaching because it is a long string of little things that sometimes add up to a big thing. I still save those notes from kindergarten parents and occasional student evaluations that tell me I made a difference, but, for most of my students I was only a little thing. My desire to do big things is how I am able to set aside my anxieties about public speaking and driving in strange cities in order to speak to audiences of teachers and administrators. I am certainly not a big time speaker but I seek to leave a reassuring message. I suspect that message is most often found in a small story. God does not often ask us to do the big things. Most of the time, the work He sets before us consists of small tasks. He does not often allow us to see how these small acts of mercy lead to a big thing. He does not promise us this. Instead, He asks for our humility and obedience. St. Paul understood this. At the beginning of his letter to the Romans we see the sum total of his resume. Paul could certainly write himself a fancy introduction. He could tell many stories of big things including new churches, jail escapes, shipwrecks, and snake bites. He knows, however, that what he does is not so important as who he is. Furthermore, his identity is found only in what Christ has done for him. This is how the little things add up to big things – the big things belong to God. May God bless you as you seek to accomplish the little things He sets before you.